Welcome to my new favourite way of cooking. If you can call it that. It goes like this – put in oven, remove from oven, chuck in blender. Total hands on time = 15 minutes. Yes, even we ex-MasterChef contestants and avid home cooks have lazy days sometimes. It’s probably the wrong time of year for soup in Australia what with it almost being summer already but I don’t care. Because Melbourne weather is unpredictable at best and I’ve declared soup to be an anytime food. The inherent simplicity of this recipe has got me wondering why we don’t all eat soup more often. It’s quick, healthy and can usually be thrown together with whatever is on hand in the fridge. But most of all, soup can be whatever you want it to be. Want it to be fancy – add a generous helping of butter and/or cream, blend it and call it a velouté; want it to be simple – roast vegetables, blend with some sort of liquid. Want it to be somewhere in between? Put some sort of garnish on top to dress it up a bit. Freeze leftovers, if there are any. Maybe they have a bad reputation as sick people food – usually bland, a little boring and all one texture. 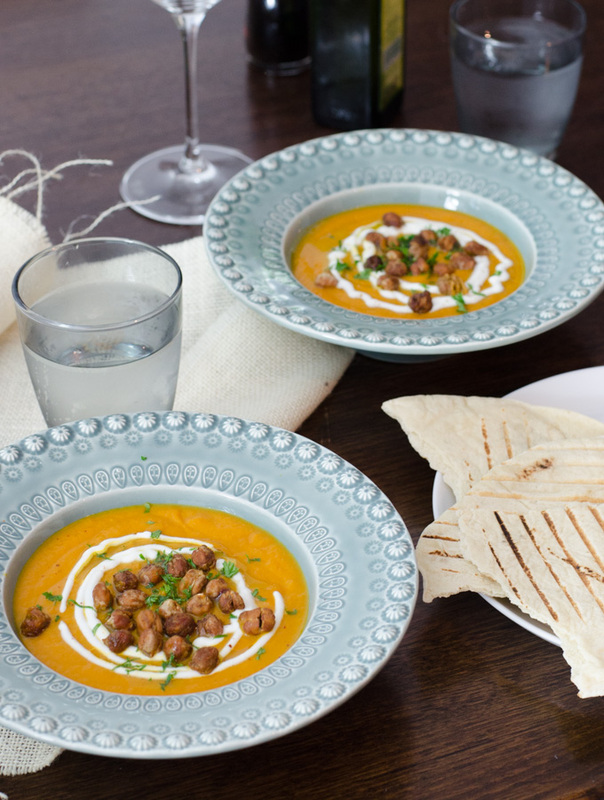 But with a bit of spice and a generous dose of crunchy topping for contrast, soups make for a pretty glamorous yet comforting weeknight dinner any night of the year. I’ve intentionally kept this recipe rather vague because it’s meant to be that very lazy, wing it kind of cooking. Add whole onions or tomatoes to the roasting tray if you have them to hand, and can be bothered. As long as the soup is seasoned to taste, it’ll be fine. I topped this with toasted chickpeas, some curd I had in the fridge, a good glug of olive oil and some chopped parsley. Drain the chickpeas and save the liquid for vegan meringue (more on that later). Reserve approximately two thirds of the chickpeas for the soup. Get a large baking tray - put carrots and garlic cloves to one side and a handful of chickpeas on the other. Splash some olive oil on then sprinkle coriander, cumin and paprika on top of both the carrots and chickpeas. Bake for approximately 25-30 minutes until carrots are cooked through. If the chickpeas aren't quite crunchy yet, return to the oven for 5 more minutes. Put the carrots and garlic into a blender, making sure to squeeze the garlic out of their skins. Add the reserved chickpeas and stock and blend until smooth. Add more water if you prefer a thinner consistency of soup. Season with a generous squeeze of lemon juice, salt and pepper to taste. Top with a swirl of buffalo curd, toasted chickpeas, parsley and a splash of olive oil.